The faces behind Ottawa Businesses. A community photo blog. You have two restaurants on Elgin Street, "town" and "CITIZEN", I guess technically CITIZEN is on Gilmour but they are both part of the Elgin Street community. What about Elgin Street made you decide to open your doors here? We actually lived in an apartment around the corner and were in the exact space (as a different restaurant then) when we decided we wanted to own our own restaurant. We were sitting in a booth at the 'elgin street freehouse' as it was known then when we finally said 'we can do this...'. 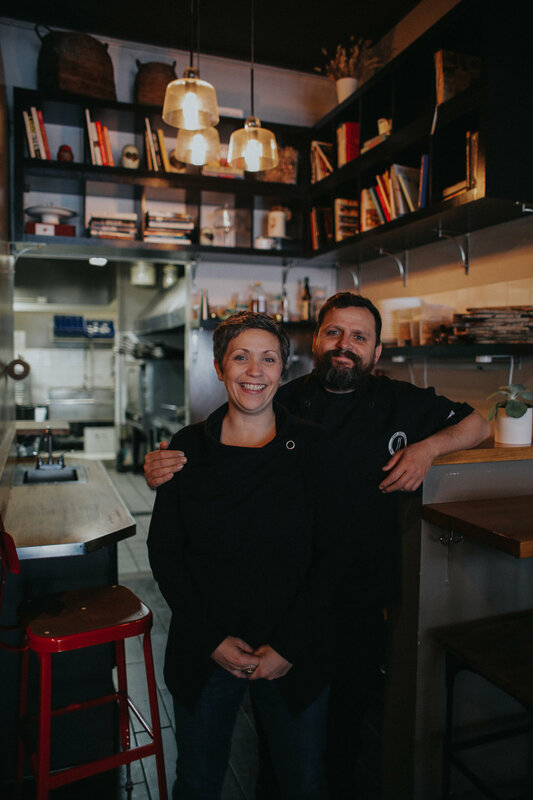 it was quite a few years before we could afford to, but we always thought it would be a great place to be....the Elgin street community always seemed like our neighbourhood so we were lucky that the space was available just as we were ready to get started. Are two restaurants the same amount of trouble (work) as one? Oh no...definitely double the trouble (work) ...they each have their own vibe and personality but we are lucky that the kitchen connects so we can both be here to work, encourage, help and make sure everything is running smooth(ish). Locally sourced food, beer and art is an important part of town. Do you take the same 'support local' approach with the Elgin Street community? Absolutely...as best we can! We love to support Elgin street and Ottawa as a whole wherever we can....food, drinks, suppliers, art, music, culinary talent, other businesses...Ottawa is a really great place to be a part of for the variety of things we can tap into. CITIZEN, described as town's cool neighbour, has Meatless Monday's. What was the inspiration for such a day? Restaurant management includes long hours and little time for personal and family time. How do you find balance between working together and home life? We manage...we have a great team so do take days off when we can...we try to not talk about work on those days, but we both love our jobs so, what can you do. We also get to spend a lot of time together which is great...but we also try to stick to our own areas...Marc to the kitchen and me (Lori) to the front end and office...we both have our tasks which leads to little overlap....but we also get to see each other all day, every day which not a lot of couples get to do...we like it. When you do get a little time off what do you get up to? Do you eat most of your meals at the office (restaurant)? We have staff meals everyday at 4pm with everyone here who is working so that is a great way to connect and gather as a group....so that is our main meal of the day, but other than that we have a quick bite when we get home. On our days off, you will more than likely see us saddled up at the bar at one of the other Ottawa restaurants....there are so many great ones now, it can be hard to choose! Do you have a favourite memory of Elgin Street? We actually met each other on Elgin street when we worked together over 20yrs ago now, so that's a good one...been together ever since! If you could serve one Canadian celebrity, who would you have come to town? When you wake up, do you ever say to yourself "I am going to go to town"? ok sorry, I'll stop. Nope...can't say as I do. So why do you dig Elgin? 'Cause it just pretty great and always has been!